Space is a big place. Quite big, actually. Huge may be a more appropriate adjective. So huge that it received the title of “final frontier” by a famous television series, since you are not really supposed to traverse it. (The question remains, though: for it to be a frontier, isn’t it supposed to have something on both sides?) The vastness of space is both mysterious and fascinating. Man, in his ceaseless curiosity and desire for knowledge (and also the need to understand the universe around him to avoid the discomfort of death by starvation or cold), developed the science known today as Astronomy, as an attempt to unveil the mysteries of the universe. Since space is such a humongous place, one can expect it is full of mysteries. Enters the Great Attractor. The Great Attractor is a gravitational anomaly, a massive (and controversial) one. It is indirectly “observable” by its effect on the motion of galaxies, and its presence, mass and position were estimated based on the peculiar velocity of the Local Group, the galaxy group that includes the Milky Way (Kocevski & Ebeling, 2006). A nice video explaining it was made by the SciShow Space (www.youtube .com/watch?v=N9qeOhJ9dbg). It is also a quite funny name with the potential for several jokes (Fig. 1 is not one of them, but it could be). Figure 1. “Dark Flow” (XKCD, 2008; available from https://xkcd.com/502/). Note that the (rather controversial) Dark Flow phenomenon is not the same as the Great Attractor. I included this strip, though, because it is funny. The observation of the Great Attractor is difficult when restricted to the length of optical waves, due to the presence of the Milky Way. The plane of the Milky Way outshines (due to its stars) and obscures (due to the dust) many of the objects behind it (NASA, 2013). This unobservable space is called the Zone of Avoidance (ZOA; a very neat name by the way), or “Zone of few Nebulae” as initially proposed by Proctor in 1878 (Kraan-Korteweg, 2000). Not to be confused with the Phantom Zone, the prison dimension to where the people of Krypton sent their prisoners. The ZOA was “avoided” by astronomers because of the difficulties in analyzing the obscured galaxies known there (Kraan-Korteweg, 2000). Figure 2 shows a picture from the NASA/ESA Hubble Space Telescope taken in 2013 focusing on the Great Attractor. The region behind the center of the Milky Way, where the dust is thickest, is very difficult to observe at optical wavelengths. Figure 2. “Hubble Focuses on ‘the Great Attractor’”. This field covers part of the Norma Cluster as well as a dense area of the Milky Way. The Norma Cluster is the closest massive galaxy cluster to the Milky Way. The huge mass concentrated in this area and the consequent gravitational attraction makes this region of space known to the astronomers as the Great Attractor. Picture retrieved from http://www.nasa.gov/mission_pages/hubble/science/great-attractor.html (NASA, 2013). In this study, I shall propose a slightly unusual hypothesis to what could be the Great Attractor. Could this gravity anomaly be an outcome of the presence of a very big robot? The Great Attractor’s location is estimated to be at a distance of somewhere between 150 and 250 million light-years from the Milky Way (something between 1.4 x 1024 and 2.4 x 1024 meters and quite far indeed). But both the Great Attractor and our own Milky Way belong to the same structure, known as the Laniakea Supercluster (“Laniakea” means “immense heaven” in Hawaiian). The Milky Way resides in the outskirts of this supercluster, whose diameter is 500 million light-years, while the Great Attractor resides closer to its center. A supercluster is a (very) large group of smaller galaxy clusters or galaxy groups (like our own Local Group) and is among the largest known structures of the cosmos. The Laniakea Supercluster was discovered in 2014, encompasses 100,000 galaxies, contains the mass of one hundred million billion Suns, and consists of four subparts, previously known as separate superclusters (The Daily Galaxy, 2015). Japan has a peculiar relationship with robots, which have an important and established position in the country’s pop culture. The word mecha (abbreviation of “mechanical”) now refers to a whole genre of movies, manga, anime and live-action series (the tokusatsu) involving mechanical objects (vehicles, robots etc. ), autonomous or manned, which quickly became popular in Japan and abroad. While the first robot appearance in sci-fi culture is usually attributed to the tripods of H.G. Wells in 1897, the first appearance of a giant humanoid robot is attributed to Tetsujin 28-Go, a manga from 1956 by Mitsuteru Yokoyama. However, perhaps the greatest symbol of the mecha genre, and Japanese culture in general, is from a 1952 manga by Osamu Tezuka: the boy-robot Tetsuwan Atom (Astro Boy in the West). This manga was released in post-war Japan, a moment of drastic changes in culture, industry and society, where science and technology promised economic growth and transformation of social structures (Hikawa, 2013). Astro Boy was adapted into anime in the 1960s and quickly made its way to the West. Other works of the mecha genre, particularly those with giant robots (e.g., Gundam, Mazinger Z, Macross, Neon Genesis Evangelion) influenced many western works like the Transformers cartoon, the Power Rangers TV series and the movie Pacific Rim. Giant fighting robots are already a reality, by the way. Groups of American and Japanese engineers, in their desire to hasten Judgment Day, built giant robots of a few tons, capable of firing missiles and engaging in heavy fighting (Fig. 3). Figure 3. 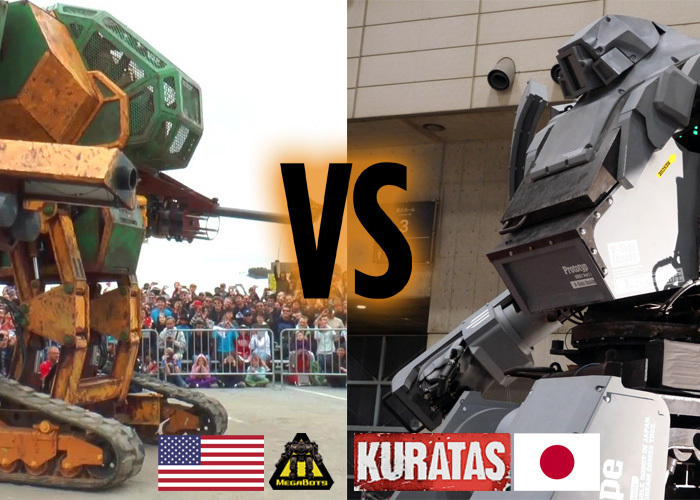 The American (Megabots Inc.) and Japanese, named Kurata, giant robots (Suidobashi Heavy Industries). Source: http://www.popularairsoft.com/megabot-challenges-japanese-kuratas-giant-robot-duel. What does this entire story about Japanese robots have to do with the massive gravity anomaly from the introduction, you ask? Well, a 2007 Japanese animation called Tengen Toppa Gurren Lagann decided to explore how “giant” a giant robot could be. The Tengen Toppa Gurren Lagann (henceforth TTGL; Fig. 4) is the largest mecha shown in the anime. According to the official series guide, the TTGL is about 10 million light-years tall (Gurren Lagann Wiki, 2016). This is somewhere around 9.46 x 1022 meters, or about 100 times the diameter of the Milky Way. It is a fairly giant robot. Figure 4. The Tengen Toppa Gurren Lagann, a quite big mecha. Official artwork from the series, available from Gurren Lagann Wiki. The existence of a robot 10 million light-years tall is very questionable for some practical reasons. The usefulness of a robot of this size is also doubtful. How could a robot of this size engage in combat (or do anything, actually)? Since nothing restricted by the physics of our universe can move faster than light, the act of throwing a single punch would take a few million years. It would take a few million years more for the pilot of this robot to find whether the punch hit the target or not. It would be a long fight. These practical questions will henceforth be disregarded here. The question posed is only one: could the Great Attractor be a consequence of the existence of the TTGL? 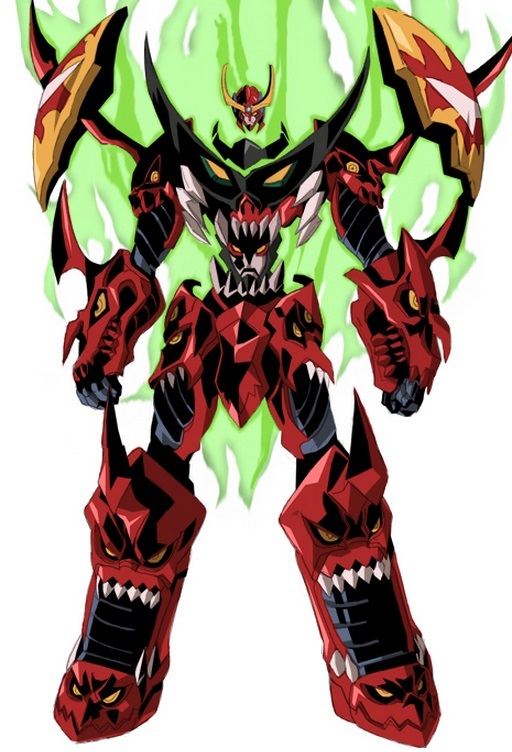 In the follow-up movie, a version of the robot entitled Super Tengen Toppa Gurren Lagann was introduced because, why not? The Super TTGL is 52.8 billion light-years tall according to the official guide book, making it about 58% the size of the universe. We shall not consider this robot. The first thing I need to do is estimating what is the mass of a robot of this size. This is not that simple, since humanity has not yet been able to build something so gargantuan. A rather crude way to do this is by applying the square-cube law (see Box 3) based on smaller robots with known mass. Since we have the height and mass of the Kurata Japanese robot (4 meters, 4.5 tons; Wikipedia, 2016a), we can use it for our estimate. The square-cube law was proposed by Galileo Galilei (1564–1642), who was apparently the first to notice that the volume of a particular object or being increased in cubic proportion to an increase in their linear dimensions, while the strength increases in square proportion (cross section of the muscles). A review of this concept was conducted by Froese (2006). The square-cube law has a number of practical applications, including studies in Biology and civil engineering, besides being a very interesting concept to be assessed in pop culture. It is not uncommon that, for super heroes, strength and size are treated almost synonymously. Heroes and villains (e.g., the Hulk, Giganta, and Apache Chief), grow in size constantly for fighting or performing feats of strength. In practice, achieving an absurd size is not practical, since the square-cube law suggests that the weight of the heroes grow much faster than their strength (that would mean they would be unable to even stand up). This law is unfortunately a significant impediment to building colossal robots. Interestingly, the spell enlarge person from the tabletop RPG Dungeons & Dragons agrees with half of the law (Cook et al., 2003). To double in size, the target of the spell has its weight multiplied by eight, in accordance with the “cube law”. However, the target receives a fixed Strength modifier of +2, instead of having an increase proportional to his/her base Strength value, which would make more sense. Applying the square-cube law to estimate the mass of the TTGL, we get the results shown on Table 1. In addition to the mass of the TTGL, I estimated the mass of other fictitious robots. This comparison was made to assess whether this estimate would be appropriate, given that several of these giant robots have established weights in official guides and other “literature”. The robots chosen for comparison were: the ATM-09-ST VOTOM (Vertical One-man Tank for Offense and Maneuvers) from the anime Armored Trooper Votoms (1983); the Gundam RX-78-2 from the anime Mobile Suit Gundam (1979); the T800 from the movie Terminator (1984; the height was defined as that of the actor Arnold Schwarzenegger; the weight of a T800 is unknown but it is thought to not exceed 1 ton, since the robot take actions such as riding a motorcycle); the autobot Optimus Prime from the movie Transformers (2007); the jaeger Gipsy Danger from the movie Pacific Rim (2013); and the real robot from Megabots Inc. mentioned above (the weight of the Megabot is known; the estimate is only for comparison purposes). Moreover, Table 1 has also the Sun and the Milky Way for comparison. We can see that, for larger robots (Optimus Prime and bigger), the estimated weight by the square-cube law becomes much greater than that given by the official guides. This lighter weights can be partially “explained” for some robots by using unknown material: Optimus Prime is made of Cybertron materials and Gundams from Luna Titanium or Gundarium. In the case of a Jaeger, I can only assume that the futuristic technology of Pacific Rim was able to develop lightweight robots to that extent (or that the movie producers just did not care). Table 1. Height and weight of giant robots and other things. The “Estimate” column is the weight estimated using the square-cube law (having Kurata’s weight and height as basis). The “Official” column is the official (or actual) weight. The mass of the Great Attractor is estimated to be about 1.000 trillion times the mass of the Sun (Koberlein, 2014). This is equivalent to circa 2 x 1042 tons, well below the estimated mass of a TTGL of 6 x 1067 tons. Just from this difference, it appears that the Great Attractor could not be a TTGL, or the gravitational attraction would be many times stronger than the one perceived (even considering that the estimated weight is wrong by a few orders of magnitude). Moreover, this is not the only problem. Such a monstrous mass distributed in such a small space would probably collapse and become a black hole. where: rs is the Schwarzschild radius; G is the gravitational constant; M is the mass of the object; and c is the speed of light in vacuum. An object whose real radius is smaller than its Schwarzschild radius is called a black hole. Calculating the Schwarzschild radius for the Milky Way, the Sun, and the TTGL gives us Table 2. Table 2. Comparison of the Schwarzschild radii of Sun, Milky Way and TTGL, with their real radii. The real radius of the TTGL is considered half its height. From Table 2, we can see that in the case of the TTGL, the Schwarzschild radius is many times larger than its actual size (even considering that the square-cube law has overestimated the mass of the robot by some orders of magnitude). This means that the robot, if existed, would become a giant supermassive black hole. Incidentally, the estimated mass of the TTGL is also several times greater than the estimated mass of the observable universe (considering only ordinary matter), that is 1050 tons. Thus, it is unlikely that a robot this big exists. As shown by Table 1, many other robots in fiction do not follow the square-cube law to the letter. Some reasons may be proposed: they are made of fictional materials (supposedly not yet discovered by man), such as Gundarium or some Cybertron material; they were built by advanced and/or alien technology; or for any magical/supernatural reasons. The same can be valid for the TTGL, in a way. The robot is made of “a mass of continuously materialized Spiral Power”, according to the anime lore (Gurren Lagann Wiki, 2016). This Spiral Power (Fig. 5) is presented in the anime as a physical model, the connection between living beings and the universe (besides being a religion of sorts). Such definition could make us treat the structure of the TTGL as strictly “magical”, discarding any physical interpretation of its existence. Nevertheless, the robot is composed of “mass”, so it has a gravitational field. Figure 5. 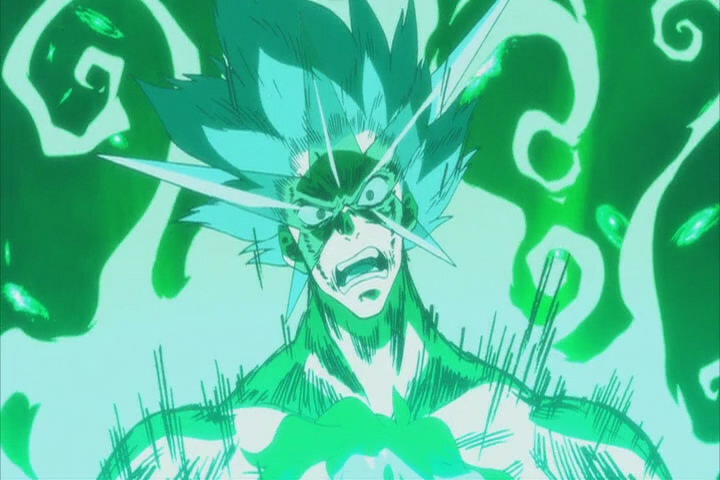 The protagonist of the Tengen Toppa Gurren Lagann anime overflowing with Spiral Power. Screenshot from the anime; image taken from Gurren Lagann Wiki. As such, I propose a second analysis for the TTGL. Knowing the estimated mass of the Great Attractor as 2 x 1042 tons, I assume that to be the mass of the TTGL. Calculating the Schwarzschild radius for that mass, we have Table 3. Table 3. Comparison of the Schwarzschild radius of the TTGL with its real radius, considering that the TTGL has the same mass as the Great Attractor. Thus, a mecha of this size and weight might not collapse into a black hole, also having a “Schwartschild radius / real radius” ratio not so different from those of the Sun and Milky Way. You see, early this year, scientists managed to identify a whole bunch of galaxies hidden in the Zone of Avoidance (Staveley-Smith et al., 2016). These researchers used a multibeam receiver on a 64-m Parkes radio telescope and uncovered 883 galaxies, many of which were never seen before. Figure 6. You never know… Image adapted from the video “Laniakea: our home supercluster”, by Nature Video; available from: https://www.youtube.com/watch?v=rENyyRwxpHo. In his 1994 novel “The Ring”, fourth book of the “Xeelee Sequence”, British hard science fiction writer Stephen Baxter proposed yet another interesting hypothesis for the origin of the Great Attractor. In his novel, the alien race Xeelee was losing a war against beings of dark matter, and retreated through an escape hatch. This escape hatch (the Ring from the title) was made of something too small to be seen by the naked eye, a cosmic string, a flaw in space time. A single inch of this “material” would weight ten million billion tons on the surface of the Earth. The ring had a mass of several galactic clusters and measured 300 light-years across, 10 million light-years in diameter. In Baxter’s book, it is discovered that this immense construction is the reason behind the Great Attractor (Orbital Vector, 2007). I am grateful to Henrique M. Soares for helping to formulate this study’s question and developing the analysis; and to Gabriel K. Kiyohara for comments that helped putting some things in perspective (pun intended). Beiser, A. (2003) Concepts of Modern Physics. 6th ed. McGraw-Hill, New York. Blain, L. (2015) June 2016: America and Japan to face off in giant robot combat. Available from: http://www.gizmag.com/kuratas-sui dobashi-megabots-giant-robot-battle-20 16 -gundams/38352/ (Date of access: 13/ May/2016). Cook, M.; Tweet, J.; Williams, S. (2003) Dungeons & Dragons Player’s Handbook: Core Rulebook 1, v. 3.5. Wizards of the Coast, Renton. Daily Galaxy, The. (2015) The Great Attractor “exists within an Immense Supercluster of 100,000 Galaxies”. Available from: http://www.dailygalaxy.com/my_weblog/2015/03/the-great-attractor-exists-within-an -immense-supercluster-of-100000-galaxies. html (Date of access: 13/May/ 2016). Frose, R. (2006) Cube law, condition factor and weight-length relationships: history, meta-analysis and recommendations. Journal of Applied Ichthyology 22(4): 241–253. Gurren Lagann Wiki. (2016) Tengen Toppa Gurren Lagann. Available from: http://gurrenlagann.wikia.com/wiki/Tengen_Toppa_Gurren_Lagann (Date of access: 13/May/ 2016). Gundam Wiki. (2016) RX-78-2. Available from: http://gundam.wikia.com/wiki/RX-78-2_Gu ndam (Date of access: 13/May/ 2016). Hikawa, R. (2013) Japanese Animation Guide: The History of Robot Anime. Japan’s Agency for Cultural Affairs. Kraan-Korteweg, R.C. 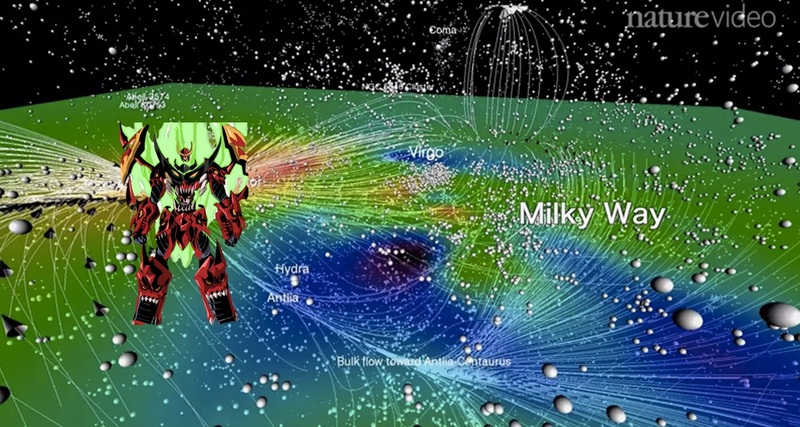 (2000) Galaxies behind the Milky Way and the Great Attractor. Lecture Notes in Physics 556: 301–344. Koberlein, B. (2014) What is the Great Attractor? Universe Today. Available from: http://www.universetoday.com/113150/what-is-the-great-attractor/ (Date of access: 13/May/ 2016). Kocevski, D.D. & Ebeling, H. (2006) On the origin of the Local Group’s peculiar velocity. Astrophysics Journal 645: 1043–1053. MAHQ. (2016) ATM-09-ST Scopedog. MAHQ Mecha and Anime Headquarters. Available from: http://www.mahq.net/mecha/votom s/atvotoms/atm-09-st.htm (Date of access: 13/May/ 2016). NASA. 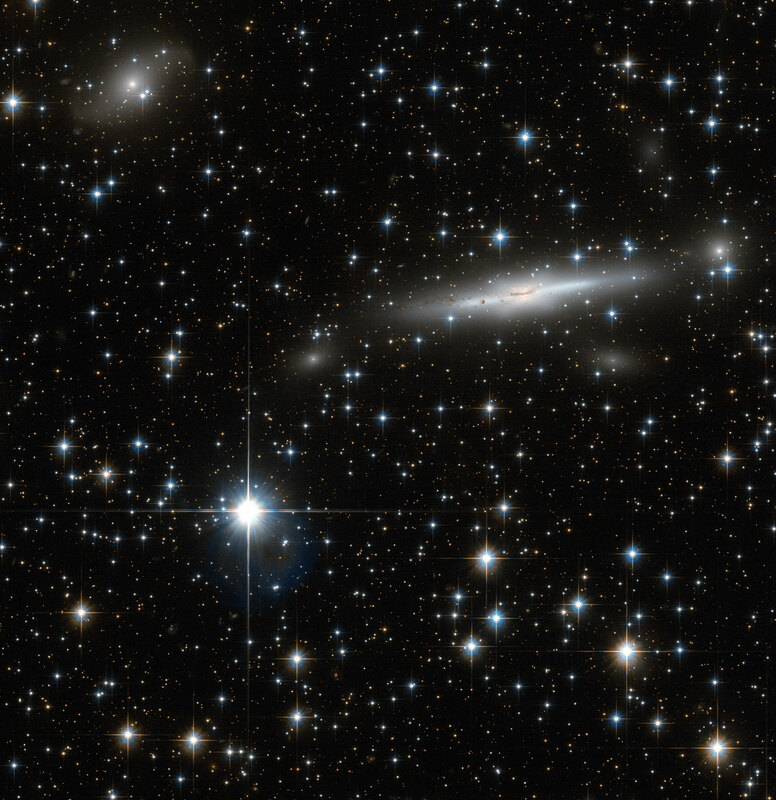 (2013) Hubble focuses on “the Great Attractor”. Available from: http://www.na sa.gov/mission_pages/hubble/science/great-attractor.html (Date of access: 13/May/ 2016). Orbital Vector. (2007) Xeelee Ring. Available from: http://www.orbitalvector.com/Mega structures/XEELEE%20RING.htm (Date of access: 16/May/ 2016). Pacific Rim Wiki. (2016) Gipsy Danger. Available from: http://pacificrim.wikia.com/ wiki/Gipsy_Danger_(Jaeger) (Date of access: 13/May/ 2016). Staveley-Smith, L.; Kraan-Korteweg, R.C. ; Schröder, A.C.; Henning, P.A. ; Koribalski, B.S. ; Stewart, I.M. ; Heald, G. (2016) The Parkes HI Zone of Avoidance survey. The Astronomical Journal 151(3): 1–42. Transformers Wiki. (2016) Optimus Prime. http://transformers.wikia.com/wiki/Optimus_Prime_(Movie) (Date of access: 13/May/ 2016). Wikipedia. (2016a) Kuratas. Available from: https://en.wikipedia.org/wiki/Kuratas (Date of access: 13/May/ 2016). Wikipedia. (2016b) Arnold Schwarzenegger. Available from: https://en.wikipedia.org/ wiki/Arnold_Schwarzenegger (Date of access: 13/May/ 2016). Wikipedia. (2016c) Sun. Available from: https://en.wikipedia.org/wiki/Sun (Date of access: 13/May/ 2016). Wikipedia. (2016d) Milky Way. Available from: https://en.wikipedia.org/wiki/Milky_Way (Date of access: 13/May/ 2016).